Your right to privacy is important to us. When you share your details with us, we want you to be confident that we look after the information securely and we only use or share it in the ways we set out in this Notice. We collect your personal data through the application and recruitment process, either directly from you, or from third parties such as employment agencies or background check providers. We’ll also collect additional information from former employers and credit reference agencies. There are also several things that, by law, we have to explain to you. If there’s something you’re particularly interested in, use this contents list to skip through the sections. And if there’s anything you’re not sure about or you have more questions, get in touch with us. When we use we, us or our, we mean Coventry Building Society. Coventry Building Society is the data controller for the personal data you share with us. This means that we’re responsible for deciding how we hold and use information about you in the context of your employment with us. We manage your personal data in line with data protection regulation. To set you up as a candidate on our recruitment system enabling you to register for job alerts, apply for jobs and to offer you employment. If you don’t give us the information we need, or if you don’t allow us to ‘process’ your information, you won’t be able to register for job alerts and we won’t be able to consider you for a job. For what we mean by ‘process’, see 'How we use your information'. We’ll ask you directly for most of the information we need, however we will collect information from third parties such as your referees. You might give us information about another person, for example if you’re recommended by an employee of Coventry Building Society, we'll ask you for their employee number and name and if you’re offered employment we’ll ask you for contact details of someone you would want us to get in touch with in an emergency situation. We collect your personal and special category data (sensitive personal data) at different stages of the recruitment and onboarding process either directly from you or from third parties such as our background screening provider, recruitment agencies, former employers, official bodies (e.g. regulators) or background check providers. The type of personal and special category data we collect are detailed below. This list isn't exhaustive and there may be other personal data we use when you register or apply with us and during the recruitment process. We’ll update this Notice when there are any specific changes worth noting. These are optional to provide on our recruitment sites for diversity monitoring purposes or in the case of disability or health issues to enable us to make adjustments to our recruitment process to support any specific needs you may have through the recruitment process (e.g. in an interview or test) or ultimately in employment. You can contact us at any time if you no longer want us to use this information. For more information refer to the 'How to make a request under any of these rights' section within this Notice. Given the nature of our business and in order to comply with regulatory requirements we ask candidates to disclose their criminal record history and we carry out criminal record checks as part of our background vetting process and in compliance with our obligations in connection with employment. We’ll store notes of our contact with you on our HR systems. 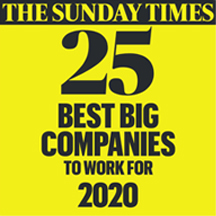 We'll also keep other records including emails, CV, covering letter, recruitment interview and assessment documents including psychometric results. If we’ve had any social media interactions with you, these will also be stored on the relevant platforms. If you’ve provided consent to be contacted by us about other job opportunities or if you’re unsuccessful in your application, we’ll keep your data for up to 12 months. If you’re successful and become an employee we’ll keep information you provided during recruitment, as well as additional information obtained during your employment, for up to seven years, following the end of your employment with us. While we hold your data we’ll keep it safe and secure, and we’ll regularly review the rules around how long we keep it for. When we no longer need your data we’ll destroy it safely and securely. Data protection laws require us to explain what ‘legal grounds’ justify us processing your information, including sharing it with other organisations. We ask for your permission to send you SMS text messages, job alerts and to add you to our talent pool which means we can let you know about other job opportunities when you register on our careers site. If you want to stop receiving them, you have the option to unsubscribe from the email received or by updating your preferences in your profile. If you no longer want to be included in our talent pool for other opportunities, you can let us know by updating your preferences. We collect your equal opportunities special category data with your consent when you register on our careers site and on our onboarding site. If you wish to withdraw your consent for the use of this type of data contact us at HR.Operations@thecoventry.co.uk or call us on 02475 184611.
to verify who you are and make checks so we can prevent fraud, money laundering and other relevant conduct. We need to do this before we enter into a contract with you. Your personal and special category data is shared with our website and recruitment online system provider, in order for you to register and apply for job vacancies. They will not share your information with any other organisation and can only process your information in the ways we have instructed. Your data is also shared with our background screening provider who will carry out some pre-employment vetting checks on our behalf. Our background screening provider will ask you for your agreement to the checks. They need to be able to show the third parties above that the checks are carried out with your agreement. Without your agreement, our Background Screening Provider can’t complete the checks and we can’t offer you employment. Any offer of employment made is subject to satisfactory preemployment checks, including references. We or our background screening provider will check your details against the Cifas databases established for the purpose of allowing organisations to record and share data on their fraud cases, other unlawful or dishonest conduct, malpractice, and other seriously improper conduct (‘Relevant Conduct’) carried out by their employees and potential employees. We, and Cifas, may also enable law enforcement agencies to access and use your personal data to detect, investigate, and prevent crime. Cifas will hold your personal data for up to six years if you are considered to pose a fraud or Relevant Conduct risk. Should our investigations identify fraud or any other Relevant Conduct by you when applying for or during the course of your engagement with us, your new engagement may be refused or your existing engagement may be terminated or other disciplinary action taken (subject to your rights under your existing contract and under employment law generally). If you apply for an executive or non-executive director position with us, your data will also be shared with a media checking company. Your personal information may also be shared with our third party assessment provider in order to set you up with online assessments, as part of the selection process for the job. We’ll share some of your personal information with HMRC for tax and National Insurance purposes once you’re employed. Your name and email address will be shared with our occupational health provider who’ll email you a medical questionnaire to complete. The information you provide enables them to recommend work place adjustments for any specific needs you may have. If you’re eligible for private medical insurance we’ll share your name, date of birth and email address with our private medical insurance provider in order for you to access this benefit. We may also be required to share your information with the Financial Conduct Authority (FCA) on their request. We can change the companies we use or appoint to provide services. When we appoint a company to provide a service on our behalf, they must meet our strict requirements about the security and privacy of your data. They are only allowed to use the personal data for the purposes stated in this Notice, and not for their own purposes. They’re not allowed to use the data for anything else without our permission. Occasionally we, or a supplier, may need to transfer data to countries outside the European Economic Area. Other countries may not have the same standard of data protection regulation as we do here in the UK. In these circumstances, we have safeguards to make sure your data is transferred securely and in line with the UK data protection standards. We’ll conduct international checks if you have lived or worked outside the UK within the last six years for the reasons set out in ‘How we use your information’ above, in particular, making a decision about your recruitment. Where fraud prevention agencies transfer your personal data outside the European Economic Area they’ll make sure the recipient’s obligations to protect your data and share it securely are outlined in their contracts. They may also need to sign up to ‘international frameworks’ which will give assurance that data will be shared securely. Remember that the majority of the information we hold or share is essential in order to consider you for a job. For example if you're applying for a job vacancy and don't want us to share your details with a credit reference agency, then we can't go ahead with your application. To ask us about these rights or to make a formal request (which is usually free of charge), get in touch with our HR Operations Team. Our contact details can be found in the ‘Who we are’ section. It’s important that you state you’re making a data subject rights request in your correspondence. We’ll reply to you as soon as we can and within 30 days. If we can’t reply within 30 days, we’ll let you know. For security, you must give us some details before we can disclose our records. To make a request to a credit reference agency, Cifas or Disclosure Barring Service (DBS), you must contact them directly. The credit reference agencies we normally use are below along with where to find their ‘Credit Reference Agency Information Notice’ (CRAIN). If you have any questions or want to complain about how we collect or process your information, get in touch. If the information we hold about you is incorrect, let us know and we’ll investigate and update our records. If you’re not happy about something we’re doing, please let us know. We aim to resolve any concerns promptly and fairly. If you have a complaint about data protection or how we use your data, contact our Data Protection Officer at Data.ProtectionOfficer@thecoventry.co.uk. Or you can complain at any time to the Information Commissioner’s Office, an independent government organisation. Find out more at ICO.org.uk. This notice is effective from February 2019. We update our Privacy Notice when anything changes or there’s new information we need to tell you. You can also download a copy of our Privacy Notice.